04 Oct Balancer or a Hoist? Make the perfect pick for your worksite. Ideal for repetitive tasks with loads in the 100-500 pound range, balancers behave like an extension of the operator’s arm and hand motions, but are they right for your workflow? Balancers follow the operator’s motions quickly and smoothly allowing workers to precisely move loads without great physical stress and greater safety than manual lifting can accomplish. They create a float sensation by balancing the load in a weightless suspension as it is moved. This makes manipulating the load easier and more efficient. So what’s the deciding factors for using balancers for load lifting? Lifting height is one consideration – lifting heights less than seven feet with a small range of motion, just at the workstation, may justify a balancer. The load movement involved with a hoist is typically not as fluid as using a balancer. To use the hoist, the operator must use both hands to control the chain motion and the lift/lower action (usually controlled by a hand-held pendant with control buttons for up, down and stop functions, unless a manual hoist). To lift the heavier loads hoists have gear ratios (balancers do not have gears and have fewer moving parts as a result). Balancers work fine between 20lbs and 500lbs, over that and you’ll be looking exclusively at hoists (hoists work at lower capacities as well as higher). A balancer doesn’t take the place of a hoist, it is used to take the load off of the person doing the job, stabilizing the machine or tool in the lift. In some situations, both are used at the same time. Typically balancers are used to move a tool and not the product being worked on. A hoist is used to manipulate and move the object/product. Another huge benefit to balancers is their ability to perform in hazardous environments, such as near explosive or flammable fumes, by using air to power the lifting and not electricity. 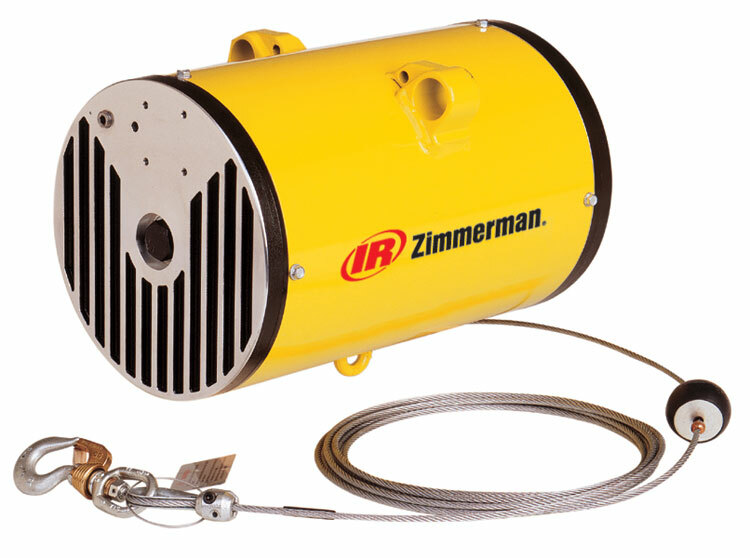 Pneumatic driven balancers eliminate potential electrical hazards. 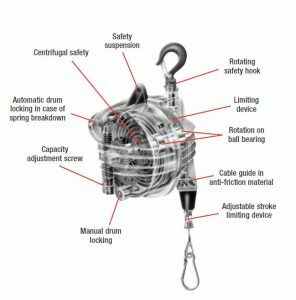 Another consideration is the number of lifts (or cycles) you would expect – balancers are suited to high cycle work environments as they have fewer moving parts and are generally quieter in operation than hoists. Balancers are virtually maintenance free as a result and are almost lubrication free (there are only three moving parts: ball nut, thrust bearing and piston, inside the balancer that require periodic cleaning and lubrication on Ingersoll Rand’s most popular models). Moisture that reaches the balancer through the supply lines is the chief factor in determining the length of time between service overhauls. Moisture traps can help to eliminate moisture and will increase the time between necessary overhauls. Balancers are usually faster too, producing speeds up to 200 feet per minute, dependent on the model you select. To help you make the selection and get the most value from your lifting device, contact an Acculift representative who will analyse your situation and devise a solution that provides the most return on your investment.